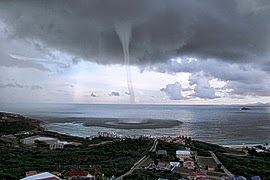 Martine van 't Laar captured this awe-inspiring waterspout on Saturday, at 5:26pm in Guana Bay/Gibbs Bay. Several other people also captured the spout which Van 't Laar said was accompanied by a "deafening thunder clap that almost wiped me of my feet." It dissipated soon thereafter. Half year till a year ago Niels and I saw a watersprout at Baie Prunes. It dissipated in time, otherwise we should have left quickly. Yesterday Martine was able to capture this one. Today we had another day with torrential rain and thunderstorms. The pelicans were not scared at all of this weather. In fact, on the contrary, they were diving like crazy to catch some fish.